OS grid reference: SU 1521 6965. In a field on Fyfield Down 1 mile east of Marlborough, Wiltshire, stands the prehistoric burial chamber known as The Devil’s Den or Clatford Bottom Stone, a Neolithic monument from 5,000 years ago that is also known as a Dolmen (stone table). To reach the site head north on the footpath from the A4 (Bath Road) opposite Clatford village and near the “private” entrance to Manton House Estate, then after about 950 metres via west to the monument on Fyfield Hill which is in a little valley. They own much of the land on this side of the road, so keep to the footpath if possible. The town of Marlborough is 1 mile east on the A4, while Avebury is 2 miles to the west. Nearby, to the east stands an ancient mound which has given its name to the town of Marlborough. You may well come across some crop circles in the fields around The Devil’s Den! Don’t be surprised! 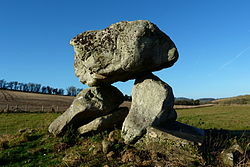 The Devil’s Den burial chamber stands upon a low mound that was originally part of a long barrow – which is still visible near the south-east edge of the field in the form of a recumbant “outlier” stone; the barrow would have been 230 feet in length. So what we see here today is almost certainly a reconstruction from the early 1920s – the stones having fallen down. The large capstone now only stands on two supporting stones, the other upright lies recumbant, though there might have been another two or three stones here long ago. Originally this burial chamber would have been covered over by an earthen mound but, over time this has been either ploughed away, or eroded away by the weather. Recent evidence ‘suggests’ it might never have had an earthen covering? The large, chunky capstone is said to weigh 17 tons or more and to have at least two cup markings on it. And there is a legend concerning these cup-marks. A number of well-respected antiquarians have visited the site including the great William Stukeley in the early 1740s; he called this ancient monument a kist-vaen (cist). According to local tradition “if water is poured into the hollows on the capstone, a demon will come along in the night and drink it.” But there are many legends and myths associated with the devil around these ancient sites, most of them should be taken with a pinch of salt over the left shoulder! It might be that the devil was considered the only one who could build such a monument, but we know different. In the grounds of Marlborough College (SU1836 6867) at the north-east side of the town – a stepped grassy mound is thought to be where Merlin the Magician lies buried, but infact, it is Maerl’s Mound and the town’s name is derived from this. One or two places in Wales migh also claim to have Merlin buried in their neck of the woods! It was probably, originally, a prehistoric burial mound or barrow pre-dating Merlin which in the Middle Ages had a small castle built over it. Though Maerl or Maerla could well be ‘one and the same’ as Merlin? Romantic Britain, ed. by Tom Stephenson, Odhams Press Limited, Long Acre, London WC2, 1939. AA Illustrated Guide To Britain, Drive Publications (Reprint), London WC1, 1982. 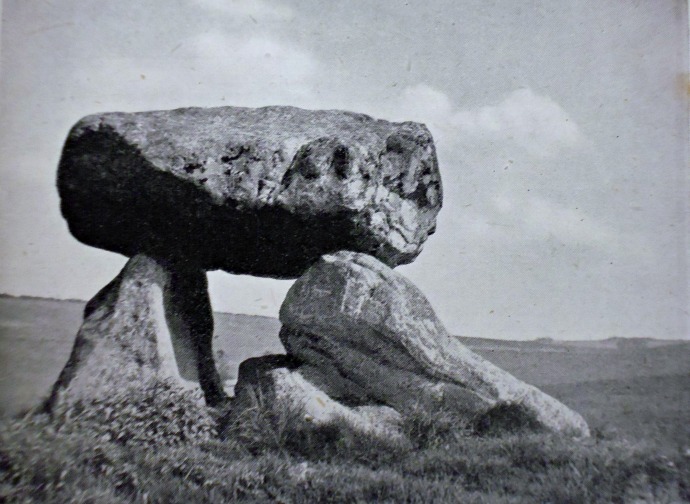 Categories: Burial Chamber | Tags: The Devil's Den at Clatford in Wiltshire, The Devil's Den on Fyfield Down in Wiltshire | Permalink.